Every season we try at least once ordering Super in Your Box Seats when we attend a performance at the Hollywood Bowl. 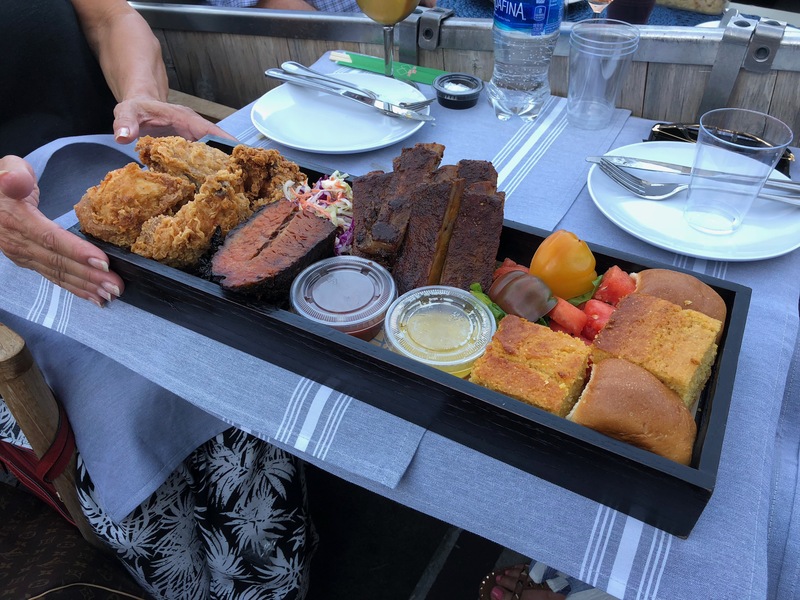 Super in Your Box Seats is part of the Hollywood Bowl’s Food + Wine program. There are many choices including 3-course meals, a la carte choices, picnic boxes and my favorite; family style dinners. We often get a starter cheese plate or sushi platter then we share a family style dinner. The family style dinner is normally meant for two but is more than enough food especially considering our starter selection. There are five family style choices. 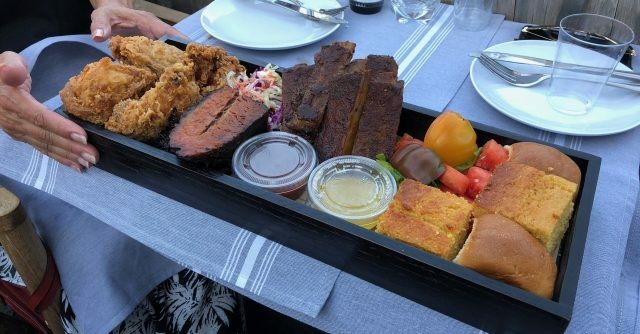 BBQ FOR TWO – sweet tea brined fried chicken; st louis style pork ribs; braised beef brisket; cornbread and rolls; tomato and watermelon salad; coleslaw; long-cooked greens; summer berry buckle with pecan streusel. MOROCCAN FEAST FOR TWO – 3 hummus- fava bean, chickpea, beet, zatar lavash; spiced carrots; shaved summer squash, preserved lemon; labneh, toasted seeds,parsley, mint; chicken tagine with apricots, saffron couscous, almond, harissa; chocolate torta, pistachio, candied citrus zest. SEAFOOD FOR TWO – maryland crab cakes with old bay aioli; lobster and shrimp rolls with meyer lemon and soft herbs; spiced steamed shrimp with cocktail sauce; succotash salad; coleslaw; potato salad; vanilla cheesecake with strawberries and blackberries. SUSANITA’S CARNITAS FOR TWO – ceviche de mariscos with shrimp, octopus and fluke; sweet corn tostadas; patio salad: cucumber, tomato and romaine; pork carnitas; javi’s guacamole; black beans; tomato rice; pico de gallo; tres leches cake with mango, coconut and lime. VEGETARIAN MOROCCAN FOR TWO – 3 hummus- fava bean, chickpea, beet, zatar lavash; spiced carrots; shaved summer squash preserved lemon; labneh, toasted seeds,parsley, mint; summer vegetable tagine with apricots, saffron couscous, almond harissa; chocolate torta, pistachio, citrus zest. Your box is set-up with table cloths, plates, utensils, bottled water and ice. The servers are attentive and helpful. You can have your dessert before the show starts or wait for intermission. You may also order wine from your server however we always bring our own. A much less expensive option. My favorite family style dinners are the BBQ and the Seafood. Both very well prepared and hold up well in the outdoor venue. You must pre-order 24 hours before your concert although in the past I’ve been able to call the day of and the Hollywood Bowl staff has been able to accommodate me. Give it a try. You will not be dissapointed.